Give one time or every week through a text message on your mobile device. Simply text the amount you would like to give to phone number 307-317-5554. You will then be prompted to either create a new account (if you would like to give regularly) or continue as a guest (for a one-time contribution). If you already have an account, you will have the option of linking your account to the phone number on your mobile device, thus making future contributions by text faster and easier. Adjust your weekly or monthly contribution amount without logging in to an online account. Enjoy the freedom of not committing your credit card or bank account to auto debit. Avoid the hassle of remembering your username or password for an online account; just link your account to the phone number on your mobile device. Don’t worry about forgetting your check or cash at home on Sundays; use your phone to give by text during the Collection time. 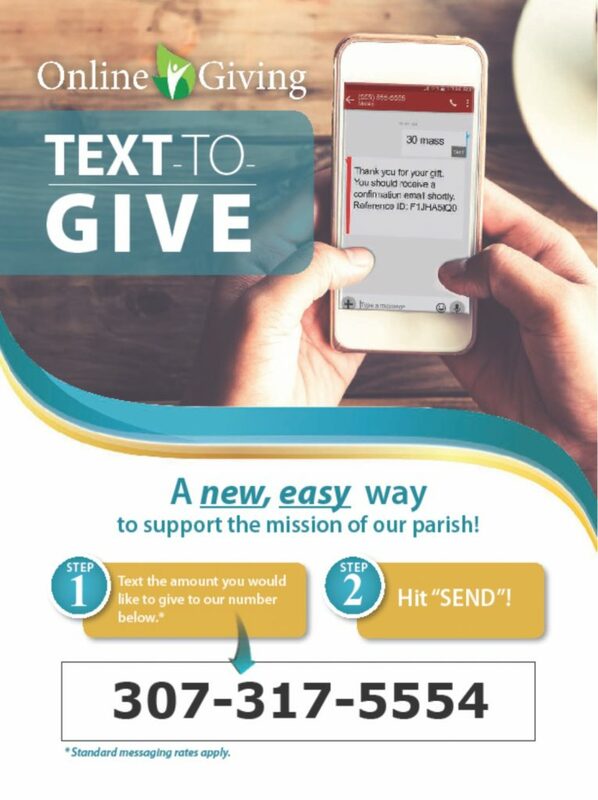 You can still give to your home parish while out of town; text your donation from anywhere in the world. Giving through a text message saves the parish on the cost of mailing offertory envelopes. Contributions through text messages also export automatically to church management software, which reduces the amount of time staff members need to spend counting and tracking contributions. Give without creating an account, if you prefer, by using the Guest option.